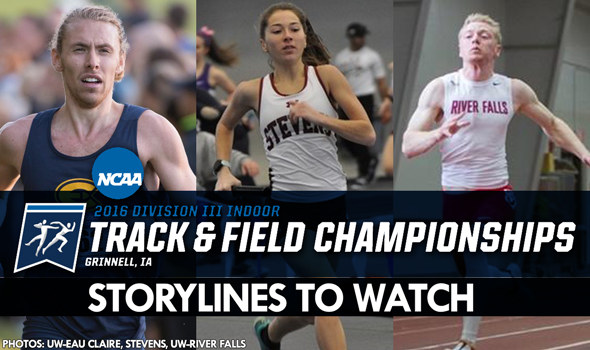 NEW ORLEANS — All eyes in NCAA Division III Indoor Track & Field will be on the Charles Benson Bear ’39 Recreation and Athletic Center in Grinnell, Iowa this weekend. That’s where the 2016 NCAA Division III Indoor Track & Field Championships are scheduled to be held March 11-12. The UW-Eau Claire men and the Illinois Wesleyan women are the pre-meet favorites according to the latest USTFCCCA National Team Computer Rankings. Second-ranked UW-La Crosse and third-ranked UW-Whitewater will make life difficult for the Blugolds on the men’s side. For the women, the Titans will be pushed by second-ranked UW-La Crosse and third-ranked MIT. When it comes to individual events, 14 of the 30 champions from last year return to defend their titles. That means more than half of the crowns are up for grabs, while the rest hope to fend off the competition. Here are six total storylines, broken down by gender, from events to watch to how the race for the team championship could be shaped. The top-ranked Blugolds have seven of their 10 entries in distance (five) and throws (two). To break it down further, six of those entries are top-3 seeds. Alex Mess is ranked No. 1 in the shot put and No. 2 in the weight throw. Josh Thorson is ranked No. 1 in the 3000 and No. 3 in the 5000. Nick Petersson is ranked No. 3 in the 3000. UW-Eau Claire’s DMR team of Kevin Brooks, Ryan Graham, Peterrson and Thorson is ranked No. 1. If those five men live up to their seeded potential, the Blugolds would receive 50 points. That total won a national title in four of the last seven years, so history could repeat itself. UW-Eau Claire also needs Darin Lau to come through — just like he did on the cross country course — and score points in the 3000 and 5000. UW-Whitewater’s Robert Starnes became the first male in DIII to clear 7-0 this season on January 22 when he soared 2.14m (7-¼) at the North Central (Ill.) Cardinal Opener. UW-La Crosse’s Brendan Diess matched him the next day. Then Mount Union’s Zack Wukotich and Central College’s Logan Mulford equaled both of them one week apart from each other in February. Now all four are entered in Saturday’s final, which is scheduled to begin at 3:30 p.m. ET. It’s anybody’s guess as to which one of those four athletes wins. But rest assured if Diess or Starnes stand atop the podium, it will go a long way in their team’s respective chances to capture a title. Close races in the sprints are always exciting. There is a chance fans could see two of them on Saturday. In the 60, both Anthony Simpson of Wesley and David Paynotta of UW-River Falls are seeded at 6.77. Then in the 200, UW-Whitewater’s Parker Witt and Paynotta come in at 21.86 and 21.87, respectively. Simpson and Paynotta have yet to race this season, while Paynotta and Witt already waged some epic battles. We’ll see what happens if each of those men reach their respective finals two days from now. The 60 final is the first to go off at 4:15 p.m. ET, followed 50 minutes later by the 200. Can IWU Jump Its Way To A Title? So the Titans and second-ranked UW-La Crosse are evently matched up in the sprints. Each team has one athlete seeded first in her respective specialty event — IWU’s Nia Joiner in the 60 and the Eagles’ Meg Heafy in the 200. If the Titans want to put any distance between themselves and UW-La Crosse, they’ll have to do so in the field — specifically the jumps. IWU has four entries in the jumps, compared to just two for the Eagles. And two of those entries for the Titans are seeded in the top-3 — Jill Harmon in the triple jump (2nd) and Amelia Glueck in the long jump (3rd). Jamie Gradishar is ranked just outside the top-8 in the pole vault (9th). Whether or not IWU exchanges its No. 1 ranking for a national title could very well be contingent on how its jumpers do. Last year there was an unfortunate mix-up during the women’s 5000. Officials lost track of the laps and there was confusion about who won. Eventually they decided to award placement based off where the athletes were after 24 laps or 4800 meters. Stevens Institute’s Amy Regan might make it easy on officials this year, though. Regan enters NCAAs the heavy favorite to win the 5000. Earlier this season Regan clocked a 16:30.98, which put her second all-time in DIII and 42 seconds ahead of North Central (Ill.)’s Megan Costanzo, who holds the No. 2 seed. Be on the lookout on Saturday since Regan could very well capture the 3000 crown as well, unless MIT’s Maryann Gong has something to say about it. Who Wants It The Most In The 60 Hurdles? The top-5 seeds in the women’s 60-meter hurdles are separated by 0.03 seconds. Ohio Wesleyan’s Sara Johnson and UW-La Crosse’s Claire Gordee are virtually tied at the top at 8.66, while North Central (Ill.)’s Madison Renfro and Baldwin Wallace’s Melanie Winters are at 8.68 and UW-Oshkosh’s Taylor Sherry is the only other female under 8.70. Johnson is familiar with Wallace and Gordee has raced Sherry, so Renfro is the odd-woman out. You should expect three of those five women to stand on the podium come Saturday afternoon. Which three will it be?